Along with viewing the map of your location, battery status, gps status and much more such as automatic flight logs and a route of your flight along with details such as height , speed and lipo remaining . Now you can experience a new view of your world, over distances up to 1.2 miles (2km) and in real time. Simply connect your phone or tablet, and a 720p HD view of everything your camera sees as you fly is displayed live. This immersive view streams to you in absolute clarity, enabling you to get that perfect shot and experience flying in a unique way. This live view is possible by DJI Lightbridge image transmission technology that is used by professional cinematographers and photographers who demand the best. Fly while seeing everything in HD, and feel what it's like to be above your world without ever leaving the ground. Higher voltage, more energy, and greater power combine to give you a vastly improved flight experience. This upgraded Intelligent Flight Battery has built-in sensors that let you know the status of your battery in real time, so you always know how long you can continue flying and when it’s time to recharge. Recharging is fast and easy, and the DJI Phantom 3 Advanced comes with an upgraded charger for substantially reduced charge times. 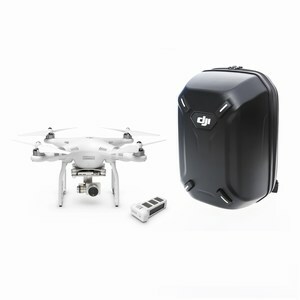 Keep your DJI Phantom 3 Advanced Quadcopter fully under your control while accessing the most used features right on the supplied remote controller. This crucial piece of your flight experience has been engineered specifically for flying camera platforms, making every flight easy, safe, and intuitive. A very sleek and modern looking remote controller with built in lipo battery for extended use and with Led indicators to show charge level. Every motor has the power and precision needed giving the best flight experience possible. The 2213 Brushless motors work with super lightning fast ESCs Electronic Speed Controllers, making your DJI Phantom 3 Advanced fast, agile, and responsive. All this combined makes for a better flying experience . A big improvement over the earlier versions of the Phantoms. This simplifies flying indoors as it will be more stable than conventional Quadcopters without this feature. Automatic elements of your Phantom 3 Advanced’s intelligent flight system help you fly and are available at the touch of a button through a clear easy to use interface.